Information on Site Rental for your special event—wedding, shower, luncheon, or cocktail party in the gardens! We at Joel Lane Museum House, Inc. (JLMH, Inc.) are delighted that you are considering the Joel Lane Museum House site for your special event. Our beautiful gardens will make the perfect backdrop for your wedding, reception, shower, luncheon, or cocktail party! We treasure our charming house which was built in 1769 and the gardens and hope that you and your guests will treat it with the care and respect that are required to preserve such an old property. The Visitors Center, circa 1840, is available for rental to groups of no more than 20. 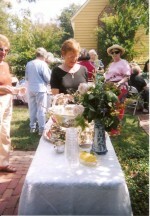 Rental of the grounds allows a maximum of 125 guests. The 1769 and 1790 buildings are not open for events and are available only for tours at an additional charge as listed below. Price: The minimum rental fee is $300 for four hours for events that end and vacate the premises by 5:00 pm. Events that last beyond that time carry a minimum rental fee of $600 for four hours. Additional hours are available at $125 per hour. Any hours or partial hour beyond the contracted time will be billed at $225 per hour, so please plan accordingly. The contracted hours include all the time you or your representatives are on the premises on the day(s) of the event and include both set up and clean up time. Rental Agreement: Must be signed and received by JLMH Inc. at least one month prior to the event. To reserve the JLMH, security deposit and rental fee are due at rental agreement signing. To download the Rental Agreement, scroll down to the end of the text. Rules: Must be signed and received by JLMH Inc. at least one month prior to the event. To download the Rules (which are Exhibit A of the Rental Agreement), scroll down to the end of the text. Payment in full: Due upon signing rental agreement, at least one month prior to event date. Security Deposit: $200 security deposit is due at time of rental agreement signing. If the premises and property are returned in the same condition as when rented, including proper cleaning, the security deposit will be refunded by U. S. mail within two weeks after the event. The cost of any cleaning or repairs deemed necessary by JLMH, Inc. will be deducted from the security deposit. A preliminary walk through for damages shall be conducted after the event has ended, and a final one may follow on the next business day during daylight hours. Cancellation: If cancelled less than seven (7) days prior to the event, 50% of the rental fee is non-refundable. If cancelled less than three (3) days prior to the event, the entire rental fee is non-refundable. In the event of cancellation prior to the event, security deposit will be refunded in full. Any refunds shall be sent by U. S. Mail within 2 weeks after the event date. Restrooms: Please plan to rent an adequate number of port-a-johns if your party includes more than 30 people. There is just one unisex restroom on the site. Tent: If Lessee rents a tent from a vendor, the tent may be set up no more than 24 hours prior to the event unless prior written approval is obtained. A tent from an outside vendor must be taken down within 24 hours of the completion of the event. Tables and Chairs: JLMH has a limited number of tables and folding chairs for rent for use on the site. Tables rent for $5 each, chairs for $1 each. Please note there are only have 15 matching folding chairs. Capacity: No more than 20 people if renting just the Visitors Center; 125 people if renting the grounds. Tent rental is recommended for outdoor events in case of inclement weather. Caterer: Caterer must meet with JLMH staff to discuss set up, staging, trash removal, and furniture arrangement at least two weeks prior to the event. No beverage fountains are allowed in the Visitors Center. Personnel: There will always be an agent on site whose function is solely to represent the JLMH to ensure that the rules and regulations are followed. He/ she will be on the property at all times during the event. He/she may not assist Lessee with party arrangements. Tours: Since additional personnel would be required to offer tours of the historic properties, they must be scheduled in advance, and the rate is based on the size of your group. If there are 20 or fewer in your group, the additional fee is $75; 21-40, $125; 41-60 $175; 61-100 $225, 101-125, $275. Time Limit: The property must be vacated by 11 pm. Please schedule your event so that clean up is completed by that time. Certificate of Insurance: Lessee shall deliver to JLMH a Certificate of Insurance with Joel Lane Museum House, Inc. as additional insured which confirms that Lessee has secured liability insurance which would cover the event, including liability for loss or injury resulting from alcohol consumption. The policy shall cover not less than $1,000,000 for property damage and $1,000,000 for bodily injury, or $1,000,000 combined single limit. Copy of Insurance Certificate must be received by JLMH two weeks prior to the event, or event will be cancelled. Deadline: If a signed copy of these Rules, Rental Agreement, and payment in full of all fees and deposits are not received by JLMH at least one month prior to the event, JLMH reserves the right to cancel the event. If copies of the Certificate of Insurance naming JLMH, Inc, as loss payee and of an approved Limited Special Occasion Permit from the N. C. Alcoholic Beverage Control Board (if alcoholic beverages will be served/permitted) are not received by JLMH two (2) weeks prior to the event, you will be notified that the event is cancelled. No smoking or illegal drugs are allowed anywhere in the buildings or on the grounds. No cooking allowed on the premises. No birdseed or rice in any building or on the grounds. No lighted candles inside any building. No amplified music allowed. The site is located in a residential neighborhood, with condos only a few feet from the garden. No picking of flowers, fruit, greenery or herbs from the gardens. No stepping in the plant beds. No furniture in the historic buildings can be taken outside. Furniture to be brought in must be approved. Anything left on the premises after end of the event will be at Lessee’s own risk. Lessee is responsible for all arrangements with equipment rental companies, caterers, musicians, florists, etc. Please instruct guests accordingly. Lessee is responsible for their actions. JLMH tent. Grassy areas in the courtyard are now brick. The perfect spot for a gorgeous event! Your guests will never forget your event at the beautiful JLMH gardens.